For generations, the Lodge Enameled Cast Iron Dutch Oven has been a favorite kitchen tool all around the world. The family of Dutch ovens has stood the test of time, always evolving while keeping that familiar quality we have all come to expect. In this article, we will be taking a deeper look at the history and product lineup of The Lodge family of enameled cast iron dutch ovens. So without further ado, let’s get started. The Lodge Company is the largest family-owned and operated cookware foundry in the United States. Celebrating over 100 years as America’s cast iron cookware source. In 1896 Joseph Lodge started a cast iron foundry in South Pittsburg, Tennessee. When the company first began they made kitchen sinks, small skillets, and stoves. They are also the only American manufacturer of cast iron cookware. Years of hard work and persistence catapulted the Lodge company from a simple local manufacturer to a national and finally an international presence. Fast forward to the 1950’s and Lodge saw an ever increasing expansion of new materials, forging machinery and new sand delivery systems. They also constructed a gas-fired furnace that would cast patterns and parts in their sand molds. As the 1950’s gave way to the 60’s, competition increased globally as well as at home. To counteract this competition they began investing heavily in new, more advanced casting techniques and machinery. One such piece of machinery was the Disamatic automatic molding machine. This was followed by the Disamatic molding and pouring system just 2 years later. Allowing for faster, more precise castings at a much lower cost. Today Lodge has expanded across the globe. After completing their new smelting plant in 2014, they have created a wealth of new jobs and have improved all aspects of their business. They currently produce over 120 cast iron product types for worldwide consumption. They are the premier manufacturer of cast iron cookware for restaurants, as well as for home use. One of their more popular products is the Double Dutch Oven. There is no doubt that Lodge has become the supreme contender for cast iron cookware. As times progressed Lodge would use many different types of casting machines and material types. Their more popular cookware infuses their cast iron dutch ovens with an enamel coating ensuring a durable yet beautiful finish. Combining Lodge’s Precise and meticulous casting techniques with beautiful easy to clean porcelain is a perfect match. The added ability to marinate highly acidic foods is also a plus. The Lodge Enameled cast iron dutch ovens also come in many different colors, shapes, and capacities. Make sure to check out our review of the Lodge EC6D43 Enameled Cast Iron Dutch Oven for our top pick of an amazing enameled cast iron dutch oven. If you are interested in purchasing this product you may go to Amazon.com and check out its product page. As durable and beautiful a these enameled dutch ovens are, they still require some minimal maintenance and care. The first thing to remember is that you will need to allow your dutch oven to cool before washing. 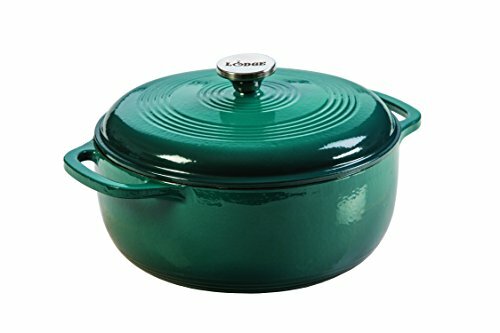 These enameled dutch ovens are dishwasher safe, however, for a longer lasting finish, hand washing is recommended. You can use warm, soapy water to clean your cookware after you remove all large food particles with only nylon or plastic scrubbers and scrapers. To remove stains you may use a damp washcloth with some baking soda. If the stains are larger or more stubborn then you can soak the enameled dutch oven for 2 or 3 hours with a mixture of 3 tablespoons of household bleach per 1 quart of water. If you are having trouble with hard baked on food than you can bring 2 cups of water to a boil with 4 tablespoons of baking soda for a few minutes. Any leftover food particles may be removed with a soft nylon scrubber or soft sponge. Make sure to dry your dutch oven before storing in a cool, dry place. When tightening knobs on your glass lids be very careful as to not crack the lid. If you are interested, check out our article on How To Clean A Cast Iron Dutch Oven. This article will teach you all about restoring and cleaning an old cast iron Dutch oven. Furthermore, it will prolong your cookware so your family can enjoy great meals for years to come. With that said, let’s take a look at some things to look out for when using your Dutch oven. You may use your Lodge Enameled Cast Iron Dutch Oven on most stovetops such as induction, gas, electric and ceramic. Just remember when transferring your dutch oven from cooktop to serving are you Must lift directly up from the cooking surface and not drag across as this may result in food spillage and injury. Your dutch oven is also NOT safe for use on open flame campfires, microwave ovens or outdoor grills. Ignoring these tips can result in product damage or serious bodily harm. It is also important to remember that most models of Lodge enameled cast iron dutch ovens are oven safe up to 500 degrees Fahrenheit. Lodge has made a lot of progress through the years. Is it any doubt they manufacture some of the best cookware around? With a wide assortment of colors and sized to choose from you can be sure you will be able to find the perfect piece of cookware to compliment your kitchen. If you would like our top choice for enameled cast iron Dutch ovens you can go to our article on the Best Enameled Cast Iron Dutch Ovens. We hope this article shed some light on the history of Lodge and their line of enameled dutch ovens. If you are in the market for an affordable dutch oven then check out our article on the Best Dutch Ovens Under $50. Thank you so very much for viewing our site and as always please take care.